For more than two decades, director Steven Soderbergh has gone back and forth from independent to studio films with personal, experimental efforts such as Schizopolis (1996) and big budget crowd pleasers such as Erin Brockovich (2000). He’s fashioned himself something of a journeyman director trying his hand at a variety of genres over the years, from period history (King of the Hill) to the heist film (Ocean’s Eleven) to the war movie (Che), adopting a distinctive style for each one. With Contagion (2011), he can now add the disaster movie to the list. This film deals specifically with the deadly virus subgenre as he tracks an infectious disease that affects the entire world with alarming speed. Would Soderbergh go the high road with thought-provoking science fiction a la The Andromeda Strain (1971) and Twelve Monkeys (1995), or would he go the low-budget horror B-movie route like The Crazies (1973) and Warning Sign (1985)? Whereas most of these rely on horror and science fiction tropes, Soderbergh eschews them for a more realistic take, albeit with a sly wink to the master of disaster, Irwin Allen, by populating Contagion with a star-studded cast of A-listers (many of whom have either won or been nominated for Academy Awards) only to kill some of them off. However, this is where the similarities begin and end as Soderbergh applies the Traffic (2000) aesthetic, juggling multiple characters and storylines to show how technology not only helps identify the threat quickly but also helps it spread rapidly thanks to globalization. The film starts off on Day 2 of the outbreak with infected people in London, Tokyo and Hong Kong where we meet Beth Emhoff (Gwyneth Paltrow) on a business trip. She comes home to her husband Mitch (Matt Damon) and family in Minneapolis suffering from what seems like flu-like symptoms. She assumes that it is nothing more than jet lag but within a day she and her son are dead. The doctors can’t tell Mitch why they died and he’s left to take care of his daughter (Anna Jacoby-Heron). The World Health Organization begins to identify all the cities where victims of the virus are appearing and trying in vain to contain it. They send Dr. Lenora Orantes (Marion Cotillard) to Hong Kong in an attempt to track down the origins of the virus. Meanwhile, muckraking blogger Alan Krumwiede (Jude Law) posts a clip of a man collapsing on a train in Japan and tries to peddle it to a newspaper in San Francisco but they aren’t interested. However, he soon assembles an impressive global readership that hangs on his every opinion and conspiracy theories, which not only spreads disinformation but also draws the attention of the Centers for Disease Control and Prevention. Dr. Ellis Cheever (Laurence Fishburne) is leading an investigation into the outbreak in the United States and enlists the help of Dr. Erin Mears (Kate Winslet), who travels to Minneapolis and investigates Beth Emhoff’s death. Soderbergh shows how the CDC interacts with local and national governing bodies to identify and deal with the virus while also taking us inside their laboratories where Dr. Ally Hextall (Jennifer Ehle) is working hard to find an antidote. Soon, Homeland Security steps in and their representative (Bryan Cranston) meets with Cheever to raise concerns that the virus could be weaponized and used by terrorists to attack the United States. However, it soon becomes apparent that the problem is much more serious, affecting a large portion of the world. Soderbergh inserts all kinds of shots of people’s hands interacting with objects and other people. Every time someone coughs you wonder, "Is this person sick and are they spreading the virus to others?" The always-reliable Matt Damon is Contagion’s emotional core, playing the character we get to know best and care about the most. He is heartbreaking early on as Mitch watches both his wife and son die and then finds out that his spouse also was cheating on him. He then has to pull it together and take care of his daughter. Damon is given moments to show how the strain is taking its toll on Mitch and the actor really grounds the film in something tangible for the audience to hold onto. Think of him as the equivalent to Benicio del Toro’s soulful border cop in Traffic. Damon is so good as the relatable everyman trying to deal with things as best he can. Without him, Contagion would come across as a little too cold and clinical. With the help of Cliff Martinez’s brooding, atmospheric electronic score, Soderbergh gradually cranks up the dread as the virus spreads and the situation gets increasingly worse as order breaks down — bureaucratically and then everything else follows in a domino effect with looting and rioting as people think about protecting themselves. 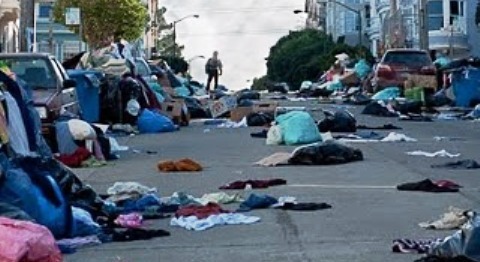 Soon, we are hit with sobering apocalyptic imagery that starts off with deserted city streets filled with garbage and abandoned cars to government officials filling mass graves with scores of dead bodies. Soderbergh is clearly drawing a parallel between the virus and technology, both of which cover great distances in very little time thanks to cell phones and the Internet. The film matches this speed by maintaining a brisk pace but does allow for the occasional moment where key characters reflect on what’s happening and how it affects not only them but their loved ones, co-workers and so on. It is these moments where Scott Z. Burns' smart, ambitious screenplay shines, allowing archetypes, such as Laurence Fishburne’s no-nonsense executive, to show their human frailties. Burns has clearly done his homework as he presents a scarily plausible viral outbreak and how we would react to it on a personal level with Mitch and his daughter while also showing its global impact. This is important because the film throws around a lot of technical jargon and dispenses a lot of facts but Soderbergh wisely has enlisted an all-star cast to make it more palatable. Contagion is not the horror film Soderbergh has suggested it might be but rather a slick, sophisticated disaster movie that should provide the director with his first substantial commercial hit in years. Excellent review, J.D. I'm looking forward to this and hope to catch the film this week. Thanks, guys.